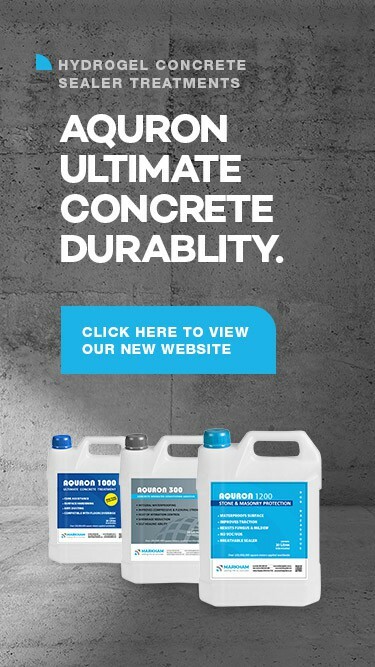 Why Aquron 7000 is easier for CONCRETE REPAIR contractors? Why Aquron 7000 is better for ASSET OWNERS? What does AQURON 7000 spray-on corrosion protection for concrete do for concrete structures? AQURON 7000 System is a multi-purpose corrosion protection for concrete innovation that extends the service life of NEW & EXISTING reinforced concrete structures. INTERNATIONAL research has proven the SIMPLE LOGIC that stopping moisture migration within concrete, results in halting all common corrosion processes, such as Chlorides Ingress, ASR, AAR, DEF, and Carbonation. The spray applied AQURON 7000 corrosion protection for concrete, provides internal corrosion protection with proven performance for over 25 years by transforming all free moisture within the concrete porosity to be part of the AQURON induced HYDROGEL that eliminates internal moisture migration. AQURON 7000 is complex completely non hazardous, 100% VOC free chemical solution with a unique catalyst enables the sprayed application to penetrate deeply into concrete by molecular attraction. Before & After Chloride Profiling has shown the AQURON treatment to have penetration over 200mm into the concrete from the surface in which it was applied. The spray applied treatment enables Corrosion Protection by stopping the moisture internally. AQURON 7000 stops the risks of moisture getting to the embedded reinforcing, and the corrosion processes which cause reinforcing steel to corrode and make concrete crack and spall The treatment is economical and offers excellent results for concrete structures including wharves and bridges.